ARMELITES have a long history in the Commonwealth of Pennsylvania. The historic Carmel in Philadelphia was a major force in publicizing the life of St. Thérèse of Lisieux and spreading devotion to her (see more on this history). Another beautiful Carmel in Elysburg, PA has long been a place a place of prayer and contemplation. Recently, ground was broken for a new Carmel in Fairfield, PA. Among the great traditions of the Philadelphia Carmel are two annual, public devotions. The first is a novena leading up to the feast of Our Lady of Mt. Carmel. The second is a triduum in honor of the Little Flower. 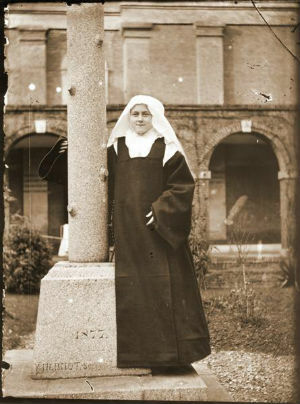 This year’s triduum begins October 1st and concludes on the feast of St. Thérèse, October 3rd. (Although the Ordinary Form celebrate St. Thérèse on October 1st, her feast day in the Extraordinary Form remains October 3rd.) The services for the triduum include a public rosary at 6:40 PM and Mass celebrated in the Extraordinary Form at 7 PM each night. Mass for the feast day will be a Solemn High Mass. The triduum is open to the public, and clergy and seminarians are welcome to attend in choir. The Carmelite Monastery of St. Joseph and St. Anne in Philadelphia is located at 1400 66th Avenue, Philadelphia, PA 19126. The world’s thy ship and not thy home. – St. Thérèse of the Child Jesus and the Holy Face, O.C.D.